By now, all those years of rough abuse and offroading have made the transfer case sticks in your Scout loose and floppy. Fix that problem with a brand new fulcrum pin! This fits all non-divorced transfer cases used in Scout 80, 800 and Scout II, which includes the Dana-18, Dana-20, and Dana-300. This also can be used in Jeeps, if you have already gone over to the dark side. 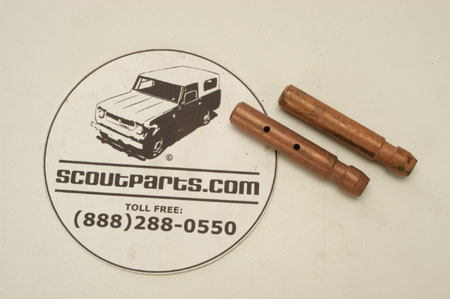 These pins are factory parts, with copper anti-corrosion plating, and a xerk fitting to allow you to grease it regularly. Get one today!